If you want to learn how to become a music record producer ?Can I learn most of what I need at home? Here is the answer: - There are quite a few schools that teach music production and offer degree programs, but there are different ways to accomplish the same goal of learning to be a music producer. If you are interested in going to music school and getting a degree in music production, than Los Angeles, California, New York has plenty of schools for you. LA has the most production schools in one area, from as far as I can tell. I would suggest visiting the area and checking out all of the different colleges that offer specialized training in music production. There are quite a few, so contact these schools, universities and trade schools in advance to see when their new student orientations are being held. You'll want to visit the different campuses and find out how the environment fits the type of music that you want to learn to produce. This is one of the most subjective things that you will have to figure out for yourself. If you are interested in producing country, than a more obvious place for you to go would be Nashville. NY and Atlanta are other hot spots for music production schools, so check them out as well. Make sure you find a great music school fit for your style. Do I Need a Music Production Degree? A great deal can be learned rather quickly by going to a school and getting your music degree. However, there are other ways to become a record producer. Matter of fact, most of the greatest record producers out there never went to a formal school. Most simply they learned by doing. 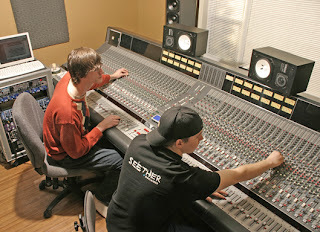 In all major cities, you can find few recording studios. Doing a quick Google or bing search for “‘cityname’ recording studios" will help you find some music schools. Contact the owners and see if they offer a mentoring, or internship program. Sometimes they'll even hire you to do odd jobs from which you can gain experience setting up some equipment and helping out with engineering. Think of it this way, you may even get paid to learn instead of shelling out a lot of money to learn the same stuff in school classrooms and studios. You may not get the same structured learning, but experience is the name in the game, not certificates on the wall. If you can make a great sounding record, than that's what matters. Here is the good chance. You can even learn music production online at Berklee University. They offer affordable pricing and a nice course structure that gives you the tools you need to learn how to become a music record producer with your own recording equipment, from home. You'll most likely need to purchase a Pro Tools LE system like the DIGI 003. There are also a lot of great E-Books, online music colleges, video tutorials (use this method absolutely free) available in web to help you get started with music production, but having someone to work with you is the best way to learn. Music Production Schools teach the students the different aspects of producing a music album such as composing, song writing, mixing and mastering, sound recording etc. to him. Fairly certain he'll have a great read. Many thanks for sharing! speaking intelligently about. Now i'm very happy I came across this during my hunt for something relating to this. to be happy. I have read this put up and if I could I desire to suggest you some fascinating things or tips. Do not rekon I get thіs 2 b truе. Myt havе to lοok elswheгe to gеt it. to fav to look at new information on your site. Very gοod article. I'm facing many of these issues as well..
Hi there to all, how is everything, I think every one is getting more from this website, and your views are pleasant for new visitors. a bit up fast! What host are you the usage of? Can I am getting your associate hyperlink for your host? this actual post incredible. Great activity! you've hit the nail on the head. The problem is something which not enough people are speaking intelligently about. I am very happy that I stumbled across this during my search for something concerning this. These schools are really helpful for the music production and i have really got great help from you.